(Papaya, Large Red) The large red papaya (photo above) ripened to this yellow color on our countertop. 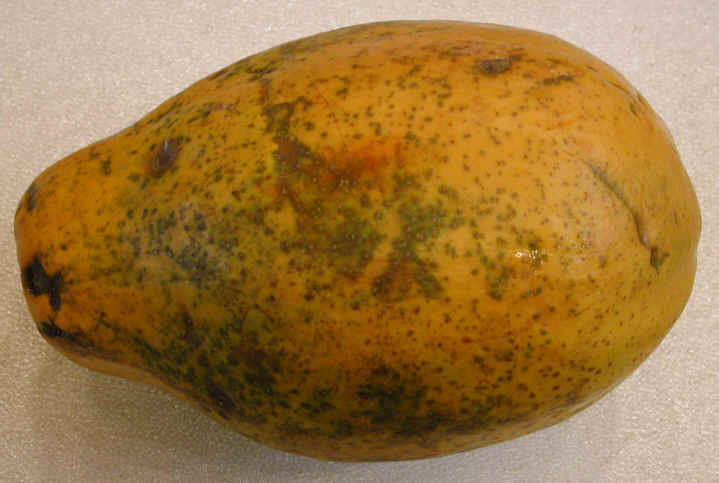 Select a papaya that is firm and free of blemishes and damage (the brown spotting is natural and is present even when the papaya is still green). A papaya is a real treat for breakfast, dessert, or a snack (see our recipe). Save the seeds to make a great salad dressing. See the nutritional chart (below) for raw papayas. 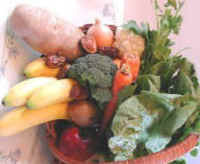 The large red papaya is harvested from the tree while still green (see full size photo), and shipped. This one was still green when we purchased it. A papaya will ripen on the kitchen countertop. 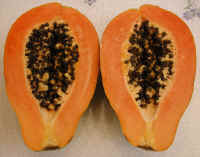 As the papaya begins to ripen on the countertop, the skin begins to yellow. (see full size photo) The photo of the fully ripened papaya is above.